Are you looking to pump up productivity, increase employee connectedness, and improve mental sharpness? Then take a break! That's right. Employees need to unplug and take a social, mental, and physical break. 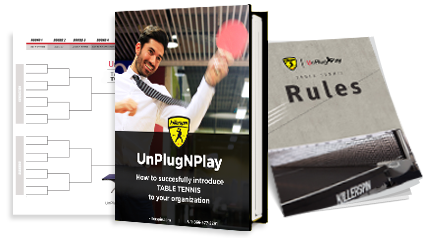 Take your company's culture for a positive spin by adding a Table Tennis Table to your break room. But don't stop there. You need a plan to make the most of it. That's why we put together this kit loaded with free helpful resources.